This utility will merge multiple files from a folder together into one new file. You can also use it to import multiple files at once into your workbook. Excel has no built-in method for merging files. It can therefore be time consuming and frustrating if you for example need to import or merge 200 Excel or CSV files. 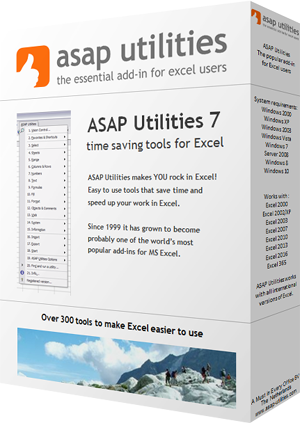 Fortunately you can use ASAP Utilities to do this quick and easy. Start the import from a certain row, with the option to make an exception for the first file. This can be useful if you have files with fieldnames and only want these listed once. Import the files into your current workbook or a new workbook. Create a new worksheet for each file, or merge the data into one new sheet. With this second option the data from the files will be placed below each other. Your last used settings and chosen folder will be remembered.